In times of difficulty and sorrow, the glow from a rosemary scented candle brightens the hearts of those who receive it. Perfect for a memorial service or a family celebration of life. 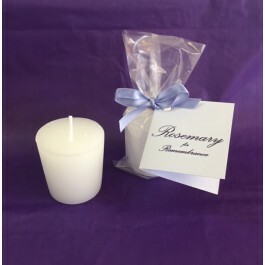 Each package includes a white rosemary scented votive candle, a soft purple Rosemary for Remembrance card explaining the meaning of rosemary, clear cellophane bag, plus a luxurious lavender and purple ribbon, Cellophane bags, cards, and ribbons are sent flat for a fresh, wrinkle free appearance. In times of difficulty and sorrow, the glow from a rosemary scented candle brightens the hearts of those who receive it. Perfect for a memorial service or a family celebration of life. Each package includes a white rosemary scented votive candle, a soft purple Rosemary for Remembrance card explaining the meaning of rosemary, clear cellophane bag, plus a luxurious lavender and purple ribbon, Cellophane bags, cards, and ribbons are sent flat for a fresh, wrinkle free appearance. Customer will put candle in bag and add ribbon and card. 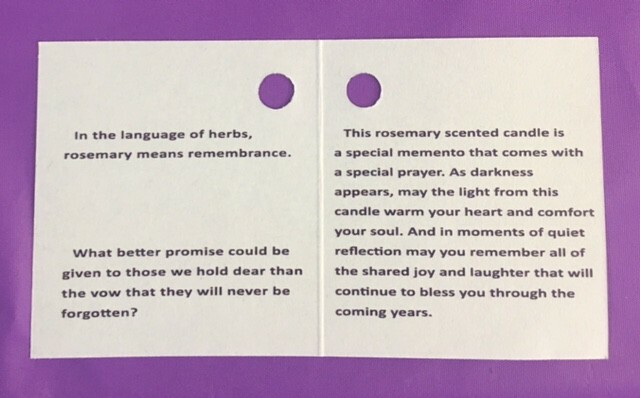 In the language of herbs, rosemary means remembrance.